The referendum on 23 June was supposed to put to bed the vexed question of Britain's relationship with the EU. It did, but not in the way most people expected, with Britons voting by a 52-48 percent margin to leave the EU. Although opinion polls had the vote as "too close to call" throughout the final two months of the campaign, surprisingly few commentators actually thought Brexit would become reality. How did Britain end up in this strange position – a land in which Nigel Farage is the most successful politician and Boris Johnson is foreign secretary? In 2015, the year in which he became the first Conservative leader to win a majority in over 20 years, David Cameron's career was at the apogee. He had, however, already sown the seeds of his own destruction by promising to hold an in/out EU referendum. "David Cameron couldn't manage the divisions in his party, and thought he needed to take on Ukip," Hilary Benn, the Labour chairman of the Exiting the EU Committee in the UK Parliament, told EUobserver. Benn described the referendum as "principally a vote against the status quo", referencing a backlash from the losers of globalisation. It was, he said, "a reflection of how politics has changed in Europe", where politics is now "in a state of flux". The Brexit vote was the product of the same dynamic as the emergence of Syriza, AfD, Marine Le Pen, and Golden Dawn, he added. 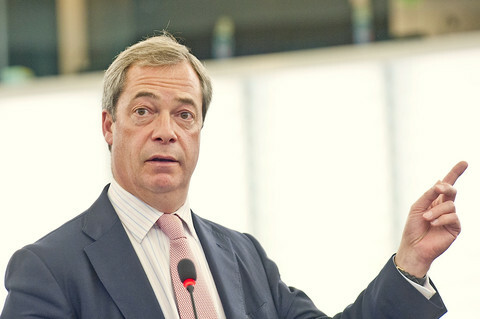 Much could and, indeed, already has been written by advisers and campaigners on both sides to describe the numerous tactical blunders and misjudgements made over several decades by successive prime ministers that led to the Leave majority. In 2016, Cameron secured only thin gruel from his talks with fellow EU leaders – removing Britain from the commitment to "ever closer union" in the EU treaties and a weak pledge to limit access to welfare benefits for migrants. But the main mistake by the Cameron-fronted Remain campaign was misjudging the public mood, focusing almost exclusively on the economic benefits of single market membership. In contrast, the Vote Leave campaign led by Boris Johnson and Michael Gove had the best slogan - "Take back control" - and based their campaign on issues like the cost of EU membership. Shut out of the official campaign, Farage and his Grassroots Out group, bankrolled by multi-millionaire Arron Banks, ran a highly professional campaign focused on immigration and also gained wide access to the airwaves. 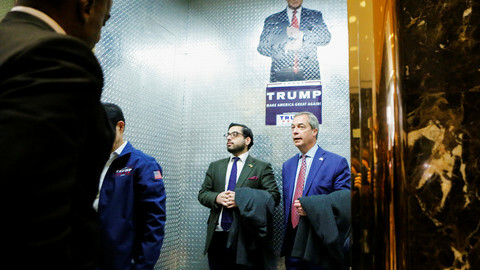 As with Donald Trump's shock defeat of Hillary Clinton for the US presidency in November, the referendum was decided by voters in long neglected parts of the UK. The North of England and Wales - former industrial heartlands and long-time Labour strongholds - delivered decisive majorities for Leave. The campaign itself was unedifying, interminable, and thoroughly divisive, marked by the assassination of Jo Cox, a Labour MP and Remain supporter, a week before the poll, by a Nazi-obsessive who shouted "Britain first" as he murdered her. Both sides were extremely economical with the truth, although the most egregious lies tended to come from the lips of Brexiteers. Cameron's half-hearted attempt to secure "special status" within the EU was followed by a half-hearted and misjudged Remain campaign which he fronted, with little help from a moribund Labour party and a Liberal Democrat party on life-support. Voters were essentially asked to vote for David Cameron's vision of EU membership. But ultimately, Britain's luckiest politician had rolled the dice one time too many. So what happens next? The new prime minister Theresa May's letter to the European Council invoking article 50 next March will officially initiate exit negotiations. Britain will leave the bloc in 2019. But it won't be straightforward. Having insisted that triggering article 50 could be done by executive order without consulting parliament, May's government was overruled at the High Court in November. Hilary Benn's parliamentary committee began its work in mid-November. However, most Remain supporting MPs have stated that they will not seek to block or delay the Brexit process. The government, meanwhile, has given few clear indications of its key demands, particularly whether it will seek to keep the UK inside the EU's customs union. Benn argues that the process of negotiating a new relationship between the UK and the EU will take much longer than the two years specified in the treaty. "Two years is so short…especially in the context of the French and German elections [in spring and autumn 2017]. There will have to be a transitional arrangement," he says. It is hard to escape the conclusion that the accidental Brexit was, in large part, the product of neglect and circumstance. It is also too late to put the genie back in the bottle. "If you think that trust has broken down in our politics, imagine if this is not implemented. The idea that parliament will turn and say 'we know better' is not going to happen," said Benn. "We all campaigned passionately for Remain, but we lost." This story was originally published in EUobserver's 2016 Europe in Review Magazine. 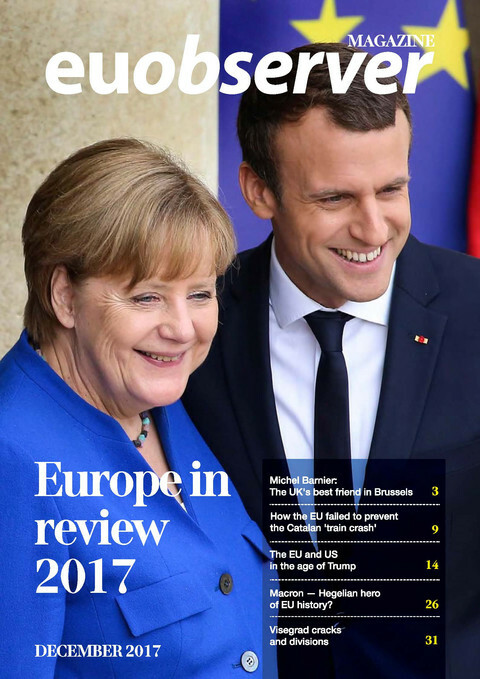 Click here to read previous editions of Europe in Review magazines. 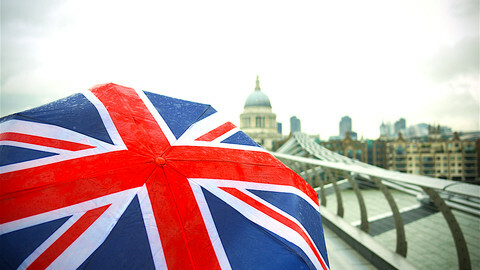 Britain’s decision to exit the EU is to prompt €69 billion of extra borrowing, a UK watchdog has said, leaving poorer families less well off. 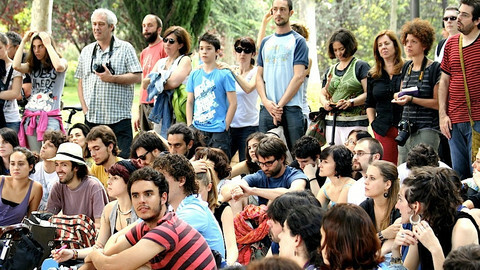 Young people have been sold down the river by this year's political events, but it's not too late for Europe to safeguard the future for the world's youth. The election of the property magnate after a campaign marked by racism, sexism and "post-truth" arguments will have consequences for EU security, politics and public debate. EUobserver wishes you a new Europe! 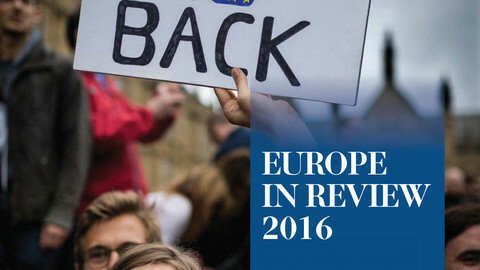 This year's Europe in Review edition looks back at all the events of 2016 that will define the coming year. 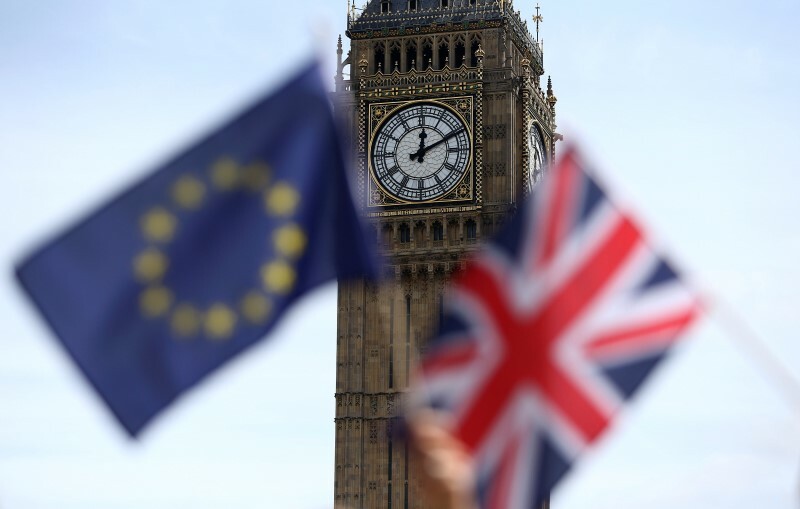 The British leader is expected to say that the UK will not aim for "partial membership" of the European Union in a policy speech on Tuesday. 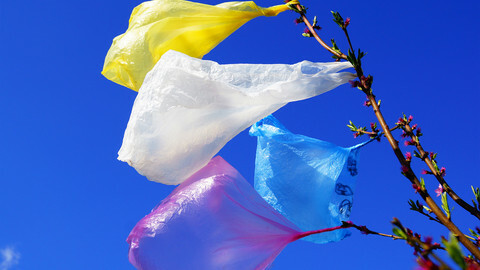 UK prime minister Theresa May is expected to announce that a ban on free plastic bags will extend to all shops. By doing so, the UK will fulfil a requirement of an EU directive. In 2018, make Europe great again! Is the EU back on track to make Europe great again? The fifth edition of EUobserver's Europe in Review magazine looks at the biggest events that shaped the EU in 2017 and prospects for 2018.